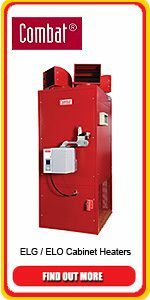 Manufacturers of Warm Air Heating equipment and Radiant Heating Systems for a wide range of commercial and industrial applications since 1966. Based in the West Midlands at Wednesbury the company provides heating solutions for aerospace, commercial greenhouses, agricultural heating and a wide range of industries. You will find Combat heating systems in large and small warehouses, factories, sports halls and gymnasia, hospitals and public buildings. 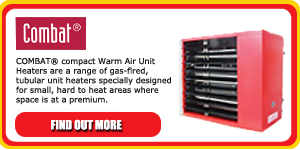 A full range of gas and cabinet heaters is available utilising Ecoflam burners in a variety of sizes. Suspended unit heaters are available in two different ranges, with both ranges having a variety of heat outputs available. Axial and Centrifugal fans are available together with various other factory options. A range of destratification fans are available including budget sweep fans and full high power commercial destratification fans. 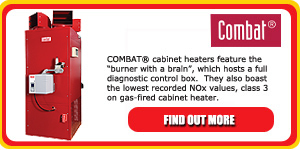 The latest range of ECO condensing heaters offer efficiency up to 109% with low NOX and CO. Premix burner technology is used in conjunction with a venturi mixing valve, controlled by a computerised control board. A drum and tube heat exchanger is utilised to allow for a smaller foot print unit. The ECO range of heater is the smallest footprint condensing heater available on the market.